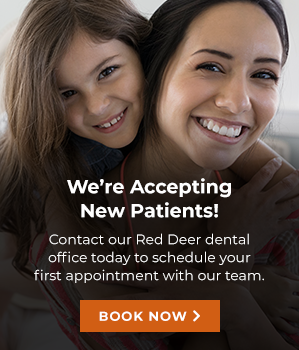 At Southpointe Dental, our Red Deer dentist provides non-surgical gum therapy for patients who are experiencing gingivitis, gum disease and other problems. Gum disease is an oral affliction that affects many Canadians. Common symptoms of gum disease include inflamed or bleeding gums, receding gums, and loose teeth. If the gum disease is in its early stages, such as gingivitis, it can be stopped or even reversed with good oral hygiene. However, if it’s more serious, we may recommend non-surgical gum therapy. This involves a variety of techniques, including curettage, root planning, and local medication. The best way to avoid any of the problems mentioned is by brushing and flossing your teeth every day. Brushing and flossing eliminate the plaque that is responsible for gum disease. To determine if you have any kind of gum disease, you will have to come in for a checkup with your dentist. Here at Southpointe Dental, our Red Deer dentists will inspect your teeth and gums to see if gum disease is present. If the infection is found and if it’s progressed to a fairly serious stage, we may recommend non-surgical gum therapy as an effective way to eradicate the gum disease. It's important to me to make sure I take the time to listen to my patients' concerns, and build a dialogue with them, so that I am better able to understand their unique oral health needs and goals.